We all know that the frigid, harsh winter months are quickly approaching. That means large amounts of snow and ice. What can be fun at times for some but winter weather and boats simply do not mix! Boat storage in the Minnesota region is very important because of extremely cold temperatures and wintry precipitation. If you are in the St. Paul, MN area, you are in luck! Let Anchor Marine Repair store your boat for the winter so that it is warm and ready to go come spring time! Not only can we store your boat, we can also handle any repairs or damage at the same time. Our professionals can perform an in depth winterization on your boat while it’s being stored. The winterization process includes full inspection, oil and filter changes, flushing of the engine, washing the engine and boat, topping off any fuel and antifreeze, and draining the livewell and pump. To properly protect a boat in the cold, Minnesota climate, boats need to be stored indoors. We offer indoor boat storage so that your favorite toy is well protected during the winter months. Our full service storage will help protect your boat much more than an at home shrinkwrap job that will not provide much protection during the winter. At Anchor Marine Repair, our goal is to make it as easy as possible for the customer. 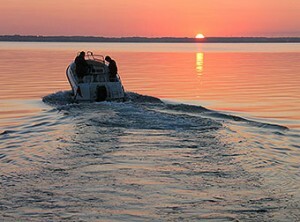 That is why we offer our boat pick up service. All you have to do is make a call into our shop and we’ll come pick your boat up for you! The only thing you need to do is come pick it up once you are ready to get your boat back on the water. Whether you have a brand new boat, or a boat that you’ve kept around for 10 years, boat storage during the winter months is vital to the life of your boat! If you are in the St. Paul, MN area, call Anchor Marine Repair today at (763) 972-3540 and let us take care of your boat before the Minnesota winter hits!